The Reno RV Show Reno only allows local dealers into the Reno RV Show and Sale. At the RV Show, participating RV dealers will be offering their best prices and each dealer will provide local service and support to their customers. Traveling RV Shows have the potential to give a bad customer experience. The traveling RV shows are not local dealers and have a much different philosophy than local RV dealers. Much of a traveling RV show’s inventory for sale is used. The Nevada DMV will not allow them to sell competing brands in the local market. Traveling RV Shows have a “sell and forget” attitude. This attitude is apparent in both their sales approach and their service approach. The sales team of a traveling RV show is trained for one simple job - get the sale today. The sales training for a traveling RV show is very high pressure. The traveling RV show will move their RV’s they are trying to sell week to week to many locations across state lines attempting to sell the RVs in any territory they can. Often times the units they sell to the customer have not been recently serviced, or made ready for the customer to use. The fact that they have no local service or support for the customer leaves you in a situation where you would have to drive long distances, or often have to pay for warranty work or have long lead times to get into a service center. 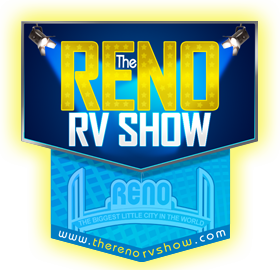 The dealers that attend The Reno RV Show Reno are committed to make your purchase of an RV not only fun, but easy. We are committed to you, our local customers, for the life of the ownership of your RV. We look forward to seeing you at the only Reno RV Show and Sale.